Mahabharata aka Mahabharat has something within it which made various creative fellows, mainly from India, curious to explore it in their own way. Mahabharat itself is a part of Jaya or JayaSamhita. It is said that Mahabharat contains everything which is found in the known (and possibly unknown too) world. Here are some of the known retellings/explorations of Mahabharat we came across. To add to the list Rahul Rai tried to explore the epic in his own way through The Myth of Hastinapur and HariHaran Raju has weaved it in his SciFi book – Barbarika. Radhika Meganathan tried to explore the tales of three archers from Mahabharat in her award winning book – The Gurukul Chronicles. Needless to say that it remains a source of inspiration for many more authors who are influenced by it in one way or the other. People from India, that is Bharat are more inclined towards the philosophical and spiritual aspects of the life and they prefer it over the material stuff. Of course, the scenario is changing rapidly, but, roots are still there. And possibly it is one of the reasons why this epic is loved so much by the readers and writers alike. The good thing about Indian scriptures is it doesn’t try to preach anything consciously. It represents actions and their consequences to the reader and let him/her decide what is right and what is wrong. 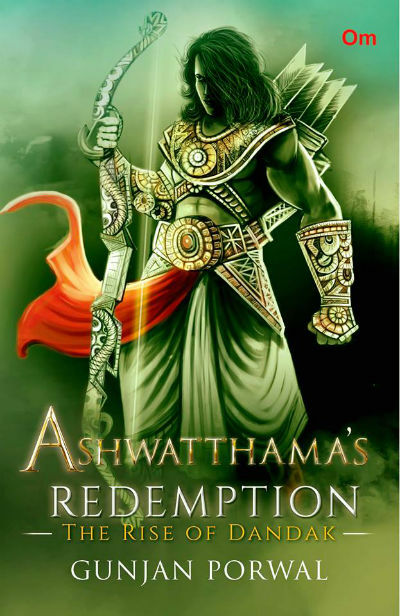 Ashwatthama’s redemption is a fantasy fiction written by debutante author Gunjan Porwal. The book has no relationship with Mahabharat directly, however, Ashwatthama, the protagonist is the link to that great epic. And yes, the book explores various important incidents of Mahabharat through the Ashwatthama’s memory. I must say that Gunjan has provided us the book a while ago. But, as we have a long “pending to read and review books” queue, it took time before it’s turn came. After reading the book, I can say that it is a really interesting experience to read this book and I enjoyed reading it. I believe in the philosophy of not judging a book (or for that matter any media) from its cover. At the same time, I sincerely believe that the book cover can influence book purchase and/or reading decisions for sure. Actually, it is in our nature to admire beauty. So, attractive book covers play a trick with the mind. Of course, ultimately the content of the book is what matters the most. But, a not-so-attractive cover decreases the potential of the book to reach to the readers. As you can see the book cover of “Ashwatthama’s Redemption – The Rise of Dandak” is full of cheerful colors. The illustration of Ashwatthama holding the Kodanada bow is attractive. These days we see that many of Indian mythological characters are illustrated using Greek themes. Some of the details of the illustration doesn’t fit with the persona of the protagonist, as explored in the book. But, it is nonetheless attractive. It is around 100 years since the war of Kurukshetra was over. The Pandavas ruled for a remarkable time and then left for the final journey of their lives. In fact, Abhimanyu’s son Parikshit ruled Bharatvarsh for remarkable time and is also no more. Parikshit’s son Janmejay is now ruling the throne of Hastinapur. But, it is not the place where key incidents of the story takes place. Above the range of Vindhya mountains, there is a kingdom named Avanti. Janak Pratap Singh is the current king of Avanti. His son, Rana Pratap Singh is the prince of the kingdom, and, as the king is away on some political aspect, he is in-charge of the kingdom as of now. Senapati Valari and Guru Apasmitra are the key fellows of Avanti administration. Surparka is a small kingdom away from Avanti and is ruled by Vikramsen. Guru Dhritiman is one of the key confidantes in Surparka administration. Vikram and Rana are good friends. One day, Rana was informed by his men about the mysterious disappearance of their rangers near the jungle. Vikram also sees the rise of suspicious activities in the Jungle and feared that something bigger is taking place under the myst. He cannot stop himself from seeking help from his new friend, once a celebrated and skillful warrior – Ashwatthama – who lives a life of anonymity and disgrace these days. Living constantly in pain, not only physical but also emotional, Ashwatthama is no more what he was. He is just a mere shadow of himself. The partial incarnation of Lord Shiva, Ashwatthama was no lesser than any warrior in Mahabharata. In fact, it is said that no one can stand against his rage. What makes the fall of his character is well-known to those who heard/read Mahabharat (or watched various TV shows, based on this epic). In this fictional tale, we see how these characters’ lives makes them united with each other and proceed on a mission to save the continent, humanity and the very existence of mankind. And, that is something better to be explored in the book, rather than talking about it :). Of course, I am not talking in detail or in the linear way the story is explored in the book to avoid the spoilers. While on one hand we find reference of Ashwatthama being considered as one of the seven immortals and thus a respected person, on the other hand, he is one of the most hated characters in Mahabharat. His final known actions of wreaking havoc in the Pandava camp after the war is over resulting in a brutal massacre in which he killed five sons of Pandavas in the dark night; made him fall from grace. Adding to it, he redirected his Brahmastra to Uttara’s womb to kill the unborn child of Abhimanyu as the final action to wipe out the Pandava lineage; did made him one of the most disgusting characters in the epic. His life, from being born to a scholar, skillful, intelligent yet poor Brahmin, Dronacharaya, grown up in a humiliating situation, taught by Parashuram himself, to become one of the most feared warriors and finally falling from the grace,… the journey of Ashwatthama’s life has many twists and turns and being considered “a Chiranjeevi” it is not over yet! So, it can be said that the author chooses the protagonist of his story quite well. It is not easy to weave the incidents from Tretayuga, Dwapararyuga, and Kaliyuga in a way that the dots can be connected in a smooth line, but the author did the task in a comprehensive manner. I like the way the author has built characters. Ditching the wrong representation of “feminism” and “gender equality” (which these days is reduced to right to abuse, male bashing, right to adultery, length of the clothing, and even some disgusting things); the author represents the character Urmila, which remind you of what an empowered person could have been. She is as strong, witty and brave as the others in her team. And, despite her feminine characteristics, which are obvious to her, is one of the most adventurous and intelligent ones in the team. I also like the way in which the references to the Mahabharata tale from various perspective are represented. The book tries to show the state of mind of the prime characters and how wisdom makes them forget hatred and start seeing things from the other person’s perspective also. These lines of wisdom from the book are evident of the same. If you know the complete truth, you will realise that everything happens for a reason. It is only when we ponder deeper that we come to understand that events that dictate our lives are controlled by our karma. The character of Raktavija is inspired by the famous asura, Raktbij. It seems, that the author tried giving a twist to the name to avoid any confusion among them. It is rightly said that the hero can be proved stronger if the villain is strong enough. The author gives proper footage to Vidyut and other antagonists in order to elaborate the strength of the prime characters. The author tried mixing many tracks and various aspects, and even some of the modern day archeological discovery (eg. of Dwarka city which was lost to the sea) are referred interestingly in the book. Telling more about various other aspects will result into spoilers which I want to avoid. However, let me share some of the interesting pieces of writing from the book which can give you a better idea about the quality of content in the book. Heaven is not a place of unlimited wealth and pleasures. It is a place where your heart finds peace and feels at home. It is not a place devoid of problems, but it is a place where you find peace in your problems too, for, without problems and obstacles, you can never grow. It was nearing dusk. Soon, the sun would seek refuge behind the mountains, leaving them in absolute darkness. Guru Apasmitra rarely spoke first. It was a sign of wisdom to listen to all the facts before presenting one’s own opinion. ‘What in god’s name is that? That’s not a snake; Rana cried aloud, as if blaming Ashwatthama for false information. ‘Nice. It desperately wanted to kiss you. You still know how to work your charm, my friend. Rna chuckled’, smiling mischievously at Vikram. Rana was speechless, ‘Wow! Such an intertwined story of revenge and hatred. What has come upon this world. Happy childhood. A blessing for a prosperous society! It is always better to explore and experience than rely on conjecture. Trust, Ashwatthama, is greater than love. You can win someone’s love again, but not their trust. My friend, terrible events happen in a war. We do things we do not wish to. We do so only to fulfil our dharma. If we do not do that, we will be held responsible for failing in our duties; and if we do it, we are termed sinners. The wounds of war leave both the victor and the vanquished equally devastated. Do not dwell too much in the past, for you cannot change it. Always strive for a better future. Life plays strange games with every individual. Unless you connect the dots, everything seems meaningless. The irony of life is, many who deserve death, live full lives, and those who deserve to live, die painful deaths. Sometimes, it is not death that people fear, but the thought of being separated from their loved ones that makes them fear death. … feelings of jealousy and revenge beget nothing but destruction of one’s own happiness. These are wasted emotions, sucking one’s peace of mind. Killing might not necessarily be through weapons; even demeaning a person through abuses is a means of killing. A man can kill himself by praising himself. Here are some more intresting lines from the book. The enemy is no mightier than the thoughts and the words we use to describe them. However, evil is unpredictable. It surfaces when you least expect it to. Evil thrives on the weaknesses of men. Evil rises on their shoulders; it feeds on bloodshed and death. Being a silent spectator wouldn’t help. Evil can only be defeated by determination and self belief. On page 151 ”’ are there instead of “ or ‘. Also, in the popular version of Mahabharat, it was “Ved Vyas” who intervened and stopped the clash of Brahmastra released by Ashwatthama and Arjuna. The narration in this book has no mention of him. One more thing I must mention. The book doesn’t try to show Ashwatthama justifying his misdeed in any way. It is not a propaganda kind of story in that context. It is a fresh fictional adventure in its own having its root in the main tale of Mahabharat. Overall, this book has more hits than the misses. If mythology retelling and adventurous thrillers are something you enjoy reading, you can definitely go for this one. As of now, the Kindle edition of the book is available at < INR 60, which is a good price. You may find the paperback a little costly.